(?) Kingsley married Estella (?) say 1881.1 (?) Kingsley died before 1897. Joel Eno Jr. was born on 18 November 1764 at Simsbury, Hartford Co., CT. He was the son of Joel Eno and Hannah (?) 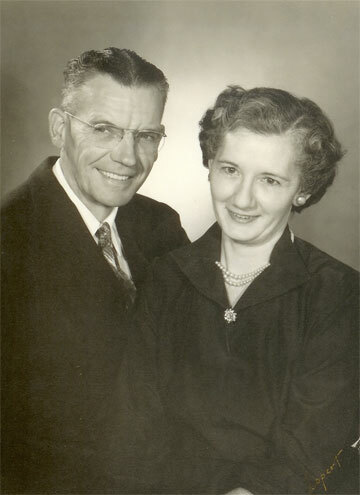 Joel Eno Jr. married Annis Pinney, daughter of Aaron Pinney and Martha Bidwell. Annis Pinney was baptized on 8 June 1766 at St. Andrew's Episcopal Church, Simsbury, Hartford Co., CT. She was the daughter of Aaron Pinney and Martha Bidwell. Annis Pinney married Joel Eno Jr., son of Joel Eno and Hannah (?). Child of Annis Pinney and Joel Eno Jr. Probably Hannah Holcombe, daughter of Joshua Holcombe, mentioned in his will as daughter Hannah married to Joel Eno. Joel Eno died on 18 November 1805 at Simsbury, Hartford Co., CT. Probably Hannah Holcombe, daughter of Joshua Holcombe, mentioned in his will as daughter Hannah married to Joel Eno. Martha Bidwell was born in 1746. She married Aaron Pinney, son of Capt. Abraham Pinney and Elizabeth Butler. Japhet Lampson was born circa 1789. He was the son of Jesse Lampson and Ruth (?) Japhet Lampson married Mary Holcombe, daughter of Amasa Holcombe and Ruth Hoskins, on 15 April 1848 at Granville, Hampden Co., MA. Ruth (?) married Jesse Lampson. [S182] Social Security Death Index (on-line), Ancestry.com, SSDI, Ancestry.com, SSAN 571-36-3876. [S418] Ruth Cost Duncan, John Case 2nd Edition, page 148, item 436. James S. Holcombe was born in June 1830.1 He was the son of Collins Holcombe and Sarah Hudson. James S. Holcombe married Sarah Elizabeth Perry on 23 October 1859 at Baptist Church, Manchester, Ontario Co., NY. James S. Holcombe died in 1914. James and Sarah were enumerated in the 1870 Cauaudaigua, Ontario Co., NY, federal census. He was a house painter, age 38, she was 32. Children in the household were Charles 9, George 8, Lizzie 5 and James 1. James and Sarah were enumerated in the 1900 Rochester, Monroe Co., NY, federal census. He was a house painter, age 69, she was 61. Children in the household were Lizzie M. 35, Burton A. 28, and Ethel A. 21. James and Sarah were enumerated in the 1910 Gaines, Orleans Co., NY federal census in the household of son-in-law Charles R. Young. Harry K. Lloyd married Mary Allice Holcombe, daughter of James S. Holcombe and Sarah Elizabeth Perry. Fred Kenneth Phillips was born at Poulney, VT.
Clara Alice Sears was born on 4 September 1870. She married William George Holcombe, son of Austin Holcombe and Abigail Jane Wanzer, on 1 August 1895 at Jefferson Co., WI. 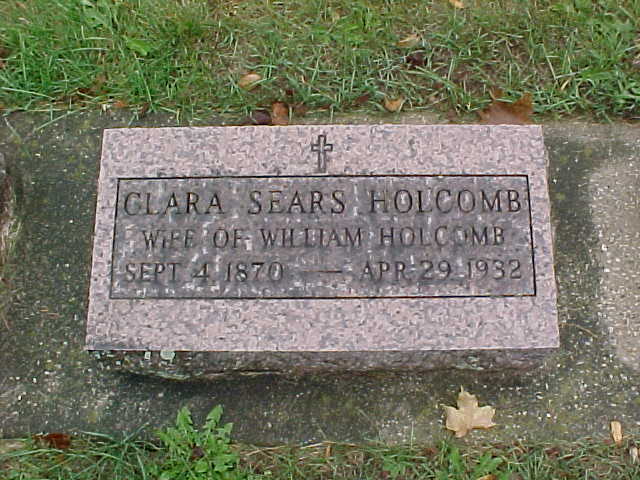 Clara Alice Sears died on 29 April 1932 at age 61. Charles O. Holcombe was the son of James S. Holcombe and Sarah Elizabeth Perry. Sarah Elizabeth Perry was born in July 1838.1 She married James S. Holcombe, son of Collins Holcombe and Sarah Hudson, on 23 October 1859 at Baptist Church, Manchester, Ontario Co., NY. Mary Allice Holcombe was born circa 1873 at Canandaigua, Ontario Co., NY. She was the daughter of James S. Holcombe and Sarah Elizabeth Perry. Mary Allice Holcombe married Harry K. Lloyd. William J. and Mary E. were enumerated in the 1910 Rochester, Monroe Co., NY, federal census. He was a painter, age 41, she was 35. Children in the household were Ralph M. 16, James G. 11. Leroy E. 9, William Earl 8, Lillian M. 5, Dorothy B. 4, Katherine A. 2, and Irene 3 months. James and Elizabeth were enumerated in the 1920 Rochester, Monroe Co., NY, federal census. He was a painter age 50, she was 40. Children in the household were James 21, Earl 18, Lillian 15, Catherine 11, Irene 10, Chester 7, and Florence 4. By the 1930 census, the widow Mary E. was living in the household of her son, William E. and his family along with her own children Catherine 22, Irene 18, Chester 16, and Florence 14, in White Plains Westchester Co., NY. Charles R. Young was born in 1873. He married Ethel A. Holcombe, daughter of James S. Holcombe and Sarah Elizabeth Perry. Charles R. Young died in 1942 at Murray, NY. Frank Collins Holcombe was born in 1881. He was the son of James S. Holcombe and Sarah Elizabeth Perry. Frank Collins Holcombe died in 1949 at Murray, NY.